So what’s so bad about being so good? 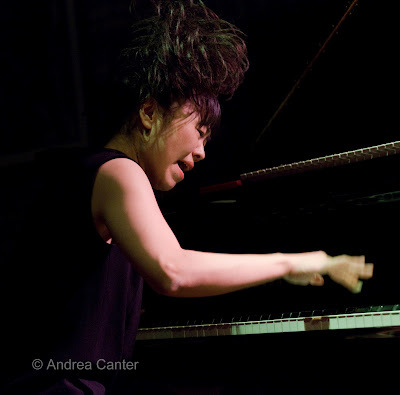 Ever since she burst onto the jazz scene nearly a decade ago, pianist Hiromi Uhera has experienced from what I will call the Oscar Peterson curse—criticism for her unashamed displays of technical virtuosity. Peterson in fact was an early supporter, as were Ahmad Jamal and Chick Corea. 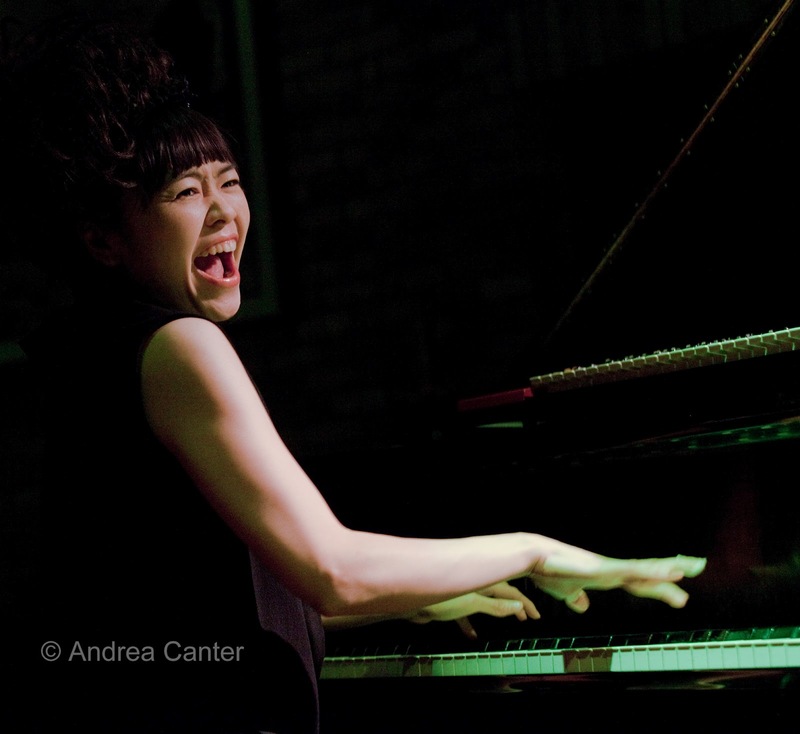 Three of the greatest jazz pianists to walk the earth saw what most critics and audiences are now able to recognize—beneath her razzle-dazzle physical skill and exuberant joie de vivre, Hiromi is also a creative artist. If she can run up and down the keyboard with Tatumesque speed and flip from mood to mood, rhythm to rhythm with Jamalish sleight of hand, she can also wring sincere emotion from every note and reinvent the most overplayed standard or classical theme. And her original compositions now rival the works of Corea, Jarrett and Tyner in their powerful imagery and insistent melodies. 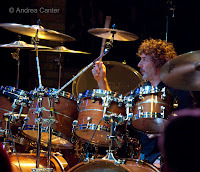 Hiromi recently came to one of her favorite venues, the Dakota Jazz Club, celebrating her 33rd birthday with an assertive, playful, wide-ranging show where the exhibition of technical overkill came, not from Hiromi, but from her drummer Simon Phillips. 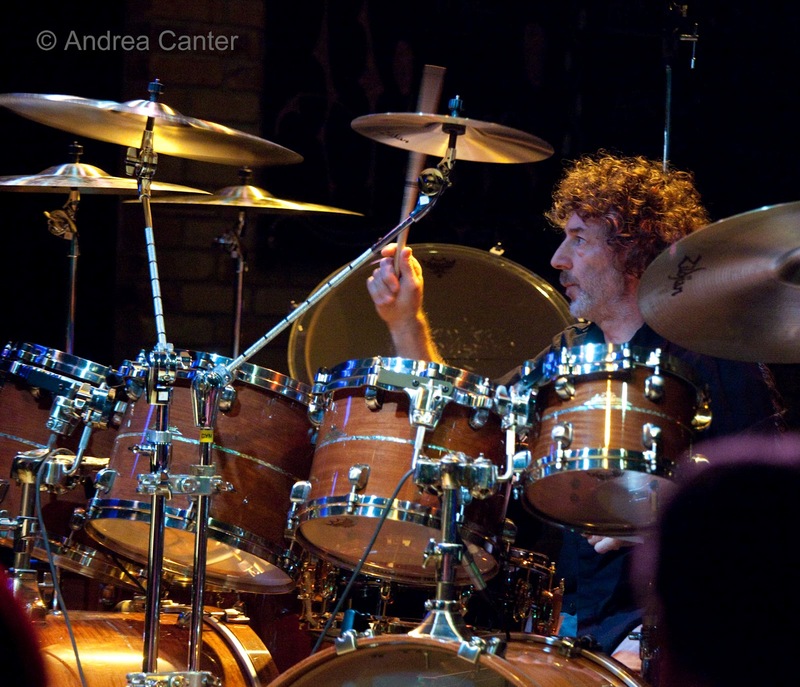 There was a reported 900+ pounds of percussion gear on stage, swallowing up Phillips as he sat with two bass drums north and another south, with multiple floor toms, snares, and cymbals thickly amassed as if a musical moat separating the drummer from the real world. His attack was surprisingly sane and supportive, but one would think he could accomplish just as much with a standard four-drum kit. Why so much firepower for a trio playing relatively small venue? What would be the gear load for a stadium show? Compared to Hiromi and Phillips, bassist Anthony Jackson was the straight man, his electric bass sympathetic throughout as he filled the space, in more ways than one, between piano and drums. Of her ensembles of the past decade—her early trio with Berklee pals Tony Grey and Martin Villahora and her quartet SonicBloom adding Dave Fiuczynski, her current Trio Project is the most savvy and most jazz-directed; despite his background in rock and accompanying arsenal, Phillips, along with Jackson, seems to push Hiromi in all the right directions to allow her virtuosity room to breathe, to serve the creative intent of her music rather than to simply amaze. Photos: From Hiromi's Trio Project gig at the Dakota, March 26, 2012. 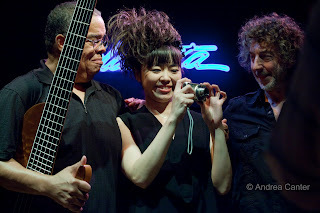 Hiromi with bassist Anthony Jackson and drummer Simon Phillips. Photos by Andrea Canter.